Headline towing numbers might look good in flash advertising, but they don’t always translate to real-world towing performance. Unless there are some basic strengths to back it up, a big towing capacity could be a towing disaster rather than a towing delight. A substantial kerb weight is promising for good towing stability (a heavy trailer is less likely to push a tow vehicle around when the tow vehicle itself is heavy), but it needs to be backed up by an engine with enough grunt to keep up with the traffic. Big torque figures aren’t everything though – things like turbo lag, too-tall gearing or plain fudging of torque figures can come into play. The most realistic tow capacities also allow you to tow up to the maximum permitted weight while also carrying the maximum payload in the tow vehicle. Dimensions can also affect towing stability: for example, a long wheelbase and a short rear axle-to-tow ball measurement tend to make a rig less prone to yawing. Then there’s fuel tank size relative to fuel economy: you expect to use more fuel when towing but you also expect a vehicle to carry enough fuel to make it to the next servo. While the RAM can tow 6989kg that’s not a realistic figure for most of us. Towing a trailer weighing more than 4500kg has legal requirements such as air brakes and most caravans weigh less than 4500kg anyway. If you only need to tow 3500kg or less, the RAM will haul every one of those kilograms like it’s not there. A hefty 3577kg kerb weight and a very long wheelbase (that makes U-turns a tiresome effort) combine to make the RAM a rock-solid towing platform. When hill climbing the RAM barely needs half throttle to hold 100km/h with a 3000kg caravan behind and its exhaust brake pegs speed downhill like no other tow vehicle we’ve tested. Being massively big and heavy means city driving isn’t as much fun though, and at near to $150,000 the American truck is a big investment. 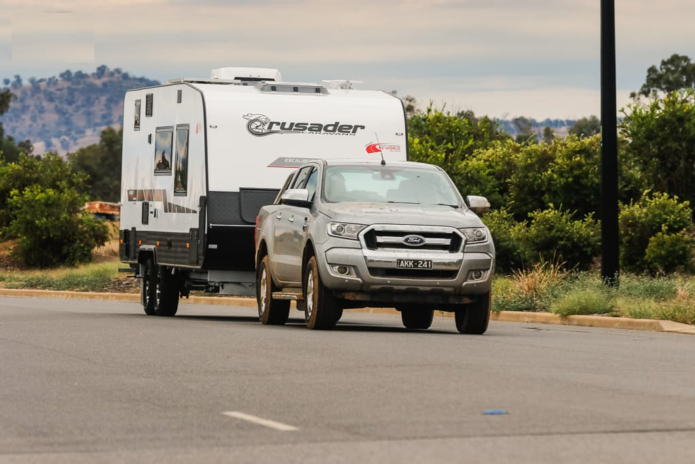 The LandCruiser 200 remains the go-to heavy hauler for most Aussie caravanners who can afford to stump up the cash for it. The big ‘Cruiser’s core ability to feel tethered to the road almost regardless of what it’s towing is incredible. The reasons for this are simple: it’s pretty heavy, has a long wheelbase and its rear axle-to-coupling measurement is relatively short. Strong performance and lush ride when towing are other pluses. Not so good is that the 200 Series is getting on (it launched in 2006 and was last refreshed in 2016) and the 4.5-litre V8 twin-turbo diesel engine is almost as thirsty as the petrol model when towing. Biggest is not always better as the Jeep Grand Cherokee proves time again when it comes to towing. While easily able to tow its maximum 3500kg it’s a relatively compact SUV wagon. As our recent 6000km journey proved yet again, the Grand Cherokee is rock-solid with a three tonne-plus van behind — it’s very stable and predictable regardless of the amount of wind buffeting and road surface changes going on. The 3.0-litre turbo-diesel V6 doesn’t have to work too hard with a heavy trailer behind, as a large wedge of mid-range torque keeps it steaming up the steepest of hills. The Ranger is one of those vehicles that just knuckles down and tows almost anything without fuss. The Ford dual-cab ute’s inline five-cylinder produces the right number of Newton-metres at the right time — thanks in part to a six-speed auto with a good spread of ratios — to flatten most hills and engine braking is excellent. Its dual-cab wheel base and fairly short rear-axle to tow hitch measurements provide it with generally confidence-inspiring towing dynamics while its rear camera – with zoom-in detail – is one of the best in the business. Only a less than ideal GCM (you’ve got a 341kg payload maximum when towing 3500kg) stymies the Ranger’s excellent towing performance. While the BT-50 received an update earlier this year, the changes were concentrated on front-end styling and multimedia rather than finessing anything that would improve towing ability. No matter; the BT-50 continues as a stable towing platform, barely moving at all when a trailer is hitched up and the in-line five-cylinder turbo-diesel performs well. 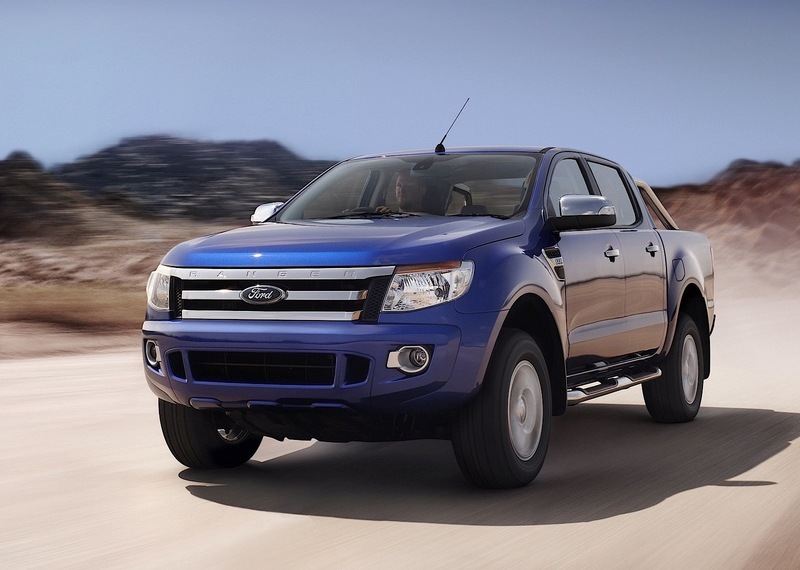 While its firmer suspension quells movement better than the Ranger, the engine has more turbo lag off the line and doesn’t seem as smooth as the near-identical Ford inline five. However, the BT-50 easily pegs speed downhill with its strong engine braking. This LandCruiser ute is the definition of old-school with its roots going back to 1984 but that doesn’t mean it’s not a good tow vehicle. The rugged ‘Cruiser is a natural when it comes to towing large, heavy trailers. It’s a pretty simple cocktail: live axles and a separate chassis, plus a low-stress V8 turbo-diesel and relatively short gearing. The Cruiser’s rear suspension barely dips with a heavy trailer dropped onto the back, and is a rock-solid towing rig. The 4.5 V8 engine is economical when towing but does lack pulling power up the hills. and the 79’s turning circle is massive. Not to mention few creature comforts in the spartan cabin. The Volkswagen Amarok TDI 550 is the performance king among the ute brigade, and its towing performance is equally impressive. The V6 diesel with its healthy 550Nm of torque makes molehills out of mountains when towing, although a lack of strong engine braking and any real urge just off the mark is not as attractive. The Amarok is very stable with a heavy trailer behind it and has the best ride quality of the one-tonne utes, whether towing or not. The only real bugbear with the Amarok is the manufacturer imposed limits on towing speed – 80km/h, with 100km/h on occasions. Like other utes, the Amarok’s payload takes a haircut when towing its 3500kg maximum – it’s just 331kg. The MU-X is really getting to be old-school now, and yet it continues to be one of the best tow wagons on the market. Its specification sheet isn’t anything special but once you hitch up a heavy trailer you soon discover the Isuzu MU-X was built to tow. It simply feels planted on the road, and engine braking is very good. Performance up hills is better than the torque and power figures would suggest, and the MU-X is pretty light on fuel when towing as well — a good thing, given its small-ish 65 litre tank. The front gets a bit of float happening on rough roads but the MU-X is among the best of the ute-based SUVs out there. With the lowest kerb weight and more torque than anything here except the RAM, the Velar is looking good for towing performance – and so it turns out with a van behind it. The Velar tows up near its 2500kg capacity like the trailer isn’t there. It’s immensely stable with a well-balanced trailer too, with no sway or pitching. The only downsides to the Velar is its 175kg (seven percent) maximum towball download at the maximum 2500kg towing weight (Aussie vans can be up around 10 per cent) and engine braking from the smooth 3.0-litre diesel isn’t great. The big Nissan scrapes into the top 10 for its irrepressible ability to get a heavy towing job done with much the same stability as a 200 Series and at not much more fuel cost than a diesel 200. It’s a good wedge cheaper than the Cruiser too. The Patrol will motor up any hill towing a heavy van with ease. While it’s not quite as rock-solid in any towing scenario as the 200 Series, the Patrol still feels relatively stable, with only a small amount of yawing on the move. The specs look good: the Patrol has a solid kerb weight (2715kg) and a relatively long wheelbase/short rear axle-to-towball measurement. While the Patrol’s 21L/100km towing average consumption might seem high, the LandCruiser 200 diesel develops a similar thirst when lugging a 3000kg trailer around. The only downside for the Patrol is the towball download – you have to reduce payload by 130kg to maintain a 350kg TBM. That still gives you a 620kg payload, which isn’t bad when you consider how hobbled some of the dual-cab utes are.